How to make Portuguese pineapple cake. Beat butter with sugar until it melts. Add the eggs gradually, continuing to beat. Add chocolate and milk, and flour mixed with yeast. Finally, add the lemon zest. Place the dough in a form, greased and floured, and bake in a preheated oven at 350 Fahrenheit. After 45 minutes, check if the cake is baked . Mix the pineapple pulp with port wine and pour it over the cake. Let it cool and unmold. Garnish with slices of pineapple and cherries. 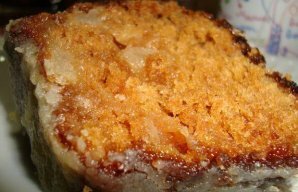 If you like fruit, you will love this Portuguese fruit cake recipe (receita de bolo de fruta) and it's very easy to make. 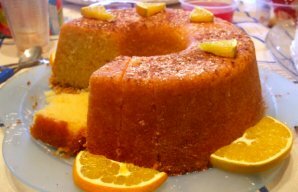 You can make this sweet, delicious and moist Portuguese orange cake in about 50 minutes, enjoy it. 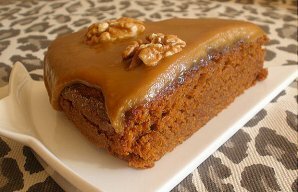 This amazing Portuguese caramel and pecan cake (bolo de caramelo e pecan) makes a great dessert or a snack, enjoy.